PMSI designs and manufactures high technology engineering in the field of pumping and chemical injection packages for the petrochemical and chemical processing industries, supplying the complete design and manufacture for a full range of equipment, from single point injection units to multi-compartmented, multi-fluid packaged systems. All constructed to International standards. 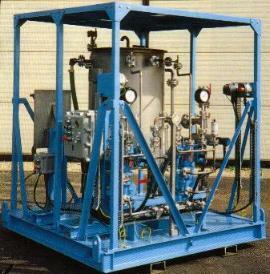 We outline below brief details of typical skid mounted chemical injection systems. 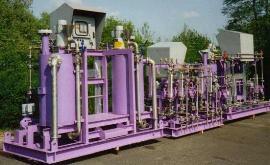 A Chemical Injection Package to enhance oil water separation injecting a Demulsifier chemical into each production train upstream of the first and second stage separators. Features include API 675 Dosing Pumps, Automatic Shutdown, Ambient Design Temperature of 55 degrees C, Zone 1 hazardous area. 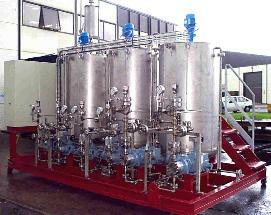 A Chemical Injection System for a Power Station and Desalination Plant. Three packages were supplied . One for the Washwater Recovery System injecting Polyelectolyte to aid settlement of washwater. The second was for the Seawater Filtration System injecting liquid polyelectrolyte as a filter aid and the third a Caustic Dosing Skid to inject variable quantities of Caustic solution to provide pH correction of the carrier water. Features include automatic proportional control of Metering Pumps by speed and stroke length through Control Panel. Polyelectrolyte powder wetting system and solution eductor system. 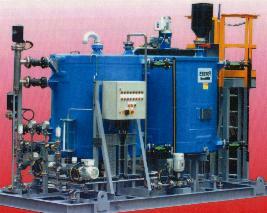 This Boiler Treatment injection Package forms part of the steam generation system in an Aromatics Complex. Polymer or Chelant, diluted with steam condensate is injected into the boiler steam drums, oxygen scavenger and neutralising amine, diluted with steam condensate is injected into the the deaerator storage drum. All injection is at low variable flowrates. This Chemical Injection System controls the chemistry of some process fluids in order to reduce or to prevent corrosion or depostion. Oxygen Scavenger is continuously injected into the feedwater stream in order to reduce the amount of 02 remaining downstream, the deaeration treatment of feedwater and into the condensate stream to reduce the corrosion problems. The scavenger solution is intermittently injected into the closed cooling water system by a common scavenger injection hardware. The dosing pumps are automatically controlled by a flow signal from the feedwater system and by residual 02 concentration signal. Ammonia is continuously injected into the condensate extraction pumps discharge. The dosing pumps are automatically controlled by a flow signal from the condensate system and by pH signal. Sodium Phosphate is injected to transform the silica content of the boiler water into Sodium Silicates. In case of raw water inlet into the condenser, Calcium and Magnesium salts are transformed into non-adherent precipitates. Installed in a petrochemical complex this Coagulant Dosing Package was supplied to prepare and feed solutions of coagulant (aluminium suplhate) and water to assist the coagulation of solids in the raw water prior to filtration in the raw water filters. Glass Reinforced Plastic tanks were supplied to BS4994 Category 1.